Kathy Morandini - American Mobile Home Sales of Tampa Bay, Inc.
Kathy Morandini-American Mobile Home Sales of Tampa Bay, Inc. I am Kathy Morandini and I have a passion for Coastal Living. I guess you could say I’m the Beach Queen! Recently I relocated to Hobe Sound from Hermosa Beach California. 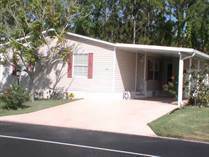 I purchased a manufactured home in a 55+ Community 3 miles from Hobe Sound Beach. That’s when it started. I realized that so many people could reach their dream of coastal living in pre or post retirement…especially if they have fixed or limited resources. I am using my skills as a Marketing Consultant and applying it to serve the buyers and sellers in this unique housing segment. After much research and training…. I have a wealth of information on the manufactured homes in the Stuart/Hobe Sound area. I am the one to call to help you buy or sell a home to maximize your time, money and lifestyle. I have found great peace and joy in this corner of the world… and my money goes so much further now…...let me help you get here too!! !